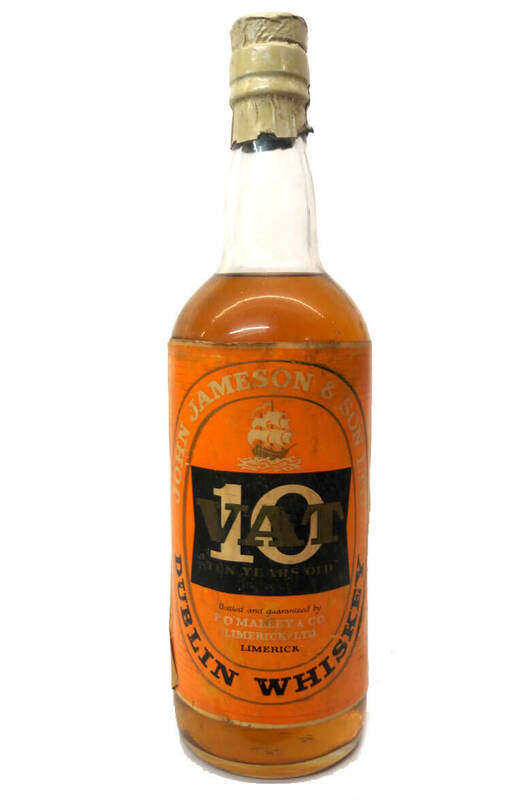 This is an interesting old John Jameson whiskey that has been bottled by Limerick trader P O'Malley and Co. Most likely dating from the 1960s or early 1970s the label states in very small print that this a pure pot still whiskey and that it is ten years old. The closure is a cork stopper and the fill level is at the top of the shoulder. As can be seen from the photograph the label is a little dog eared and slightly discoloured. There is no statement of liquid volume or alcohol content. Bottled by H. Backhouse and Co. Dundalk, this is a rare old 10 year old bottle of Jameson. The la..
An old Jameson that is most likely from the 1930s or 1940s. This was bottled by L&E Egan of Arra..
Millars were a grocers on Dublin's Thomas St who also traded in wines and spirits. They often bo..
An old John Jameson whiskey that was bottled by T.W. Begge of Bachelor's Walk in Dublin. The fil..